Sheep are gregarious in nature and love to be with the herd. A sheep will become highly agitated if it is separated from the rest of the flock. For this reason, sheep must have a leader or shepherd and must be told what to do and where to go, otherwise they'll wander off and get lost and probably die. Because of their attributes, any farmer will tell you that Sheep need the most care of all livestock. As you read this list it becomes easy to see why God would liken us to sheep. 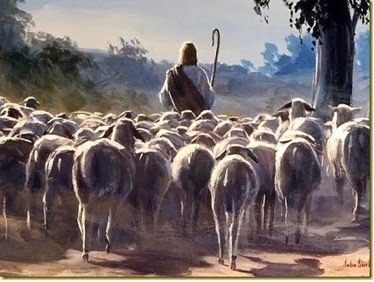 · Sheep are creatures of habit and easily get into "ruts"
· Are given names by their shepherd, and, due to excellent hearing, instantly recognize the voice of a familiar trusted person. Even when different herds mingle together (i.e. at a well) they are easily called by name to reassemble, every sheep to its own shepherd and flock. · Sheep have excellent memories for faces. They remember people who are kind to them and that have inflicted abuse on them. · Sheep have an excellent sense of smell and can distinguish different predators by smell. **Despite these defenses, sheep are incredibly gullible and easily fooled. · Sheep are remarkable also for their mutual affection and their affection for their young, much like that of humans. The sounds of affection which a mother sheep makes over her little lamb are of the tenderest kind. · Sheep are totally dependent on their shepherd for every need and guidance and its necessity and dependence are equaled by its trustful love for him who supplies its wants. Active dependence and loving trust are as evident in lambs as in humans. · Another characteristic of sheep is patience. When a sheep is caught by the shearer, at first there is a short struggle, then she gives up entirely. She shows neither resentment nor resistance; she is, in the hands of the shearer, perfectly resigned and patient. · Sheep are timid, fearful, easily panicked, especially in a flock where they stampede easily. · Sheep are vulnerable to mob psychology. The shepherd is the most effective, calming influence on sheep when this happens, but even then, due to their panicky nature, can’t always control them. Some of these characteristics exist in non-believers as well as people who love and follow the Lord. The Lord says that all must become like little children before they can enter the kingdom of Heaven; and those who are preparing for Heaven He calls His sheep and His lambs. Lambs are likened to children because of their trusting innocence, their total dependency on Him who cares for them. To them God is a parent and shepherd. He is their parent because they have laid aside to some degree their own life, and manifestly are living from a new life that He gives. He is shepherd, because they perceive His guidance and comfort in the walks of every day, and find, in following Him, wisdom and uses and delights which give satisfaction and expansion to their souls. These love the Lord more than all things and they leave all that belongs to them and is pleasant to them when they hear Him call. They trust in Him through every trial, content to feel His care protecting them, fearful only when He is absent and they are temporarily away from His presence. They are honestly innocent, because their whole heart is open to the Lord, and they cannot help rejoicing in His presence, for they are comforted and safe. They are not cumbered about serving, for what need is there when they know that every want is supplied by the Lord, their shepherd? Their own love for Him, which is to them the highest good, will increase and multiply and communicate to others in every way they can. In scripture, where animals are often mentioned, lambs are always used as representatives of innocent delight in loving the Lord; Rams are mentioned as forms of perception of truth from love to the Lord, by which that love may be multiplied; and ewes as representatives of that gentlest mutual love by which the beginnings of love to the Lord are cherished and sustained. The wool of sheep, the clothing we see them in, is the outward expression of love from the Lord consisting of trustful and charitable protection through His covering. May the blood of Jesus cover, bless and protect you!